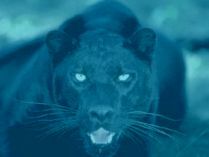 David Bryant brings you tales of monsters, phantom dogs and alien big cats! Among my particular enthusiasms is an interest in wildlife: in particular, birds. There was a time when my birding friends and I thought little of a two or three hour journey through the narrow roads of Eastern England in the hope of adding a new species to the burgeoning lists of birds we had seen! A place we often visited in those innocent, carefree days was a reserve run specifically to encourage unusual birds to visit (and perhaps breed) on the Suffolk coast, near the ancient and now almost totally vanished town of Dunwich. By our standards, it had not been a particularly good day: the rarity we had travelled to observe had departed before our arrival, and we had had to be content with a couple of Bitterns and the usual Marsh Harriers and Avocets: pretty, but nothing to us at the time! As we travelled northwards along a narrow, winding road that led to a wide estuary and the main route home, I noticed in a field by the side of the road a small caravan, from which a man emerged as we drew level. He seemed to be taking out a bag of rubbish, which he placed in a sack a few metres away from the door of the caravan. A sudden movement in the darkness under a nearby hedgerow caught my attention: I screwed up my eyes and tried to make something of the large, dark shape that moved sinuously towards the caravan. Our driver was forced to stop at a junction at this point: I was astonished to see the shape emerge into the full glare of the afternoon sun and resolve itself into the unmistakable form of a stalking lioness!!!! Stunned, I temporarily lost the power of speech! By the time my faculties had fully returned, I blurted out what I had seen: my colleagues raised their eyebrows sceptically, and could not be prevailed upon to return to the field! Well that is my story: simple? Incredible? Perhaps.... but I know what I saw! And, as if to confirm this bizarre occurrence, two days later a party of strawberry pickers some twenty miles North were surprised by a 'fully grown lioness springing over the bonnet' of their car! The above took place in 1993: a LOT of water has flowed under a lot of bridges since those days.... I am now married to one of my fellow 'twitchers' and we live happily (if frugally!) in a small Broadland village! Recently my wife Linda and I were driving home from Norwich along a narrow back road: we were forced to slow down in order to negotiate a level crossing. As is my habit, I looked right, then left just in case a train was approaching. To my total amazement not more than 150m to my left I saw a large black cat loping across the track from one bank of thick vegetation to another! This Summer (what there has been of it!) saw my wife and I driving through the night down to the West Country, via the somewhat slower but infinitely more interesting A303. dual carriageway, we were astonished to see another large panther-like cat on the central reservation, with its huge paws resting on the metal barrier! Having just been 'Gatso-ed', we were travelling slowly enough to enjoy good views of a third ABC! In October 2008, my wife and I met up with David, a fellow rock & mineral dealer, and his charming daughter Candy. Linda and I had spent the Summer organising a large public event at the Cambridge Institute of Astronomy, and on the Saturday evening had been invited out for dinner by our two friends. David & Candy knew the area really well, and suggested we dine at a country hotel in the village of Elsworth: in the event, the George and Dragon was a truly great choice: the food was memorable! Even more memorable, however, was the huge black cat we all saw illuminated by the car headlights en route! Furthermore: two cars coming from the opposite direction slowed down to allow the huge feline to lope off through a gap in the hedge! Linda and our two chums were almost spechless with amazement: we all confirmed that we had seen the beast, and discussed it at length over dinner. 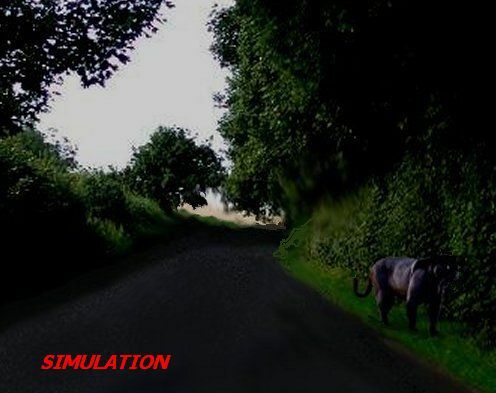 A couple of days later, David phoned to tell us that the creature had been reported several times by independent witnesses who had all seen it along the same stretch of road!